Conrad Young was privileged to spend his childhood growing up in small villages all over New Hampshire. At the age of seven, he knew that he would be an artist. His part-Indian mother and uncles were artistic, and one uncle wrote fiction novels and illustrated his own stories. Art training began in high school, and after graduation he attended the Van Emburge School of Art in Plainfield, New Jersey. There he specialized in watercolor. After art school, he worked for advertising agencies as art director for about ten years, eventually starting his own advertising agency. In 2006, after a successful advertising career, Conrad decided to pursue his love of watercolors again. 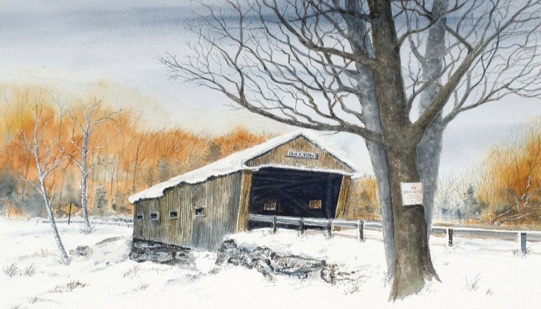 He began painting landscapes and covered bridges. Each painting is preceded by hours of taking photos, reading and researching all the elements in each painting. He has developed his own technique and color combinations and accurately documents each new concept for future generations to enjoy.